Miali Bard (9) and Jaz Williams (8) of MHS attempt to block the ball against a Dublin Coffman hitter Thursday evening. The Lady Monarchs dropped the match in three sets. The Marysville Lady Monarch volleyball team put up a good fight, but fell to Dublin Coffman in three sets on Thursday. 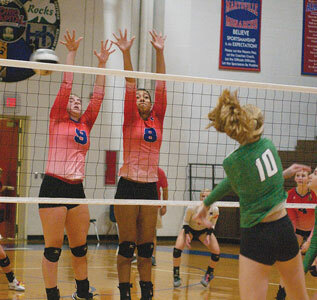 “The girls battled hard and really worked,” said coach Bethany Bentz after MHS’ 12-25, 12-25, 14-25 setback. The Shamrocks controlled the front line and were able to come up with a number of digs to keep the ball alive. Coffman took early control of the first set and coasted to victory. There was an early 4-4 stalemate during the ensuing game before the Shamrocks once again charged to the win for a 2-0 advantage. Coffman held a 5-2 lead in the third set after a Shamrock net serve. The Lady Monarchs had a difficult time digging the ball off the floor, which led to numerous Dublin points. MHS slipped to 7-13 with the loss. Madi Bentz led Marysville’s defense with nine digs. Carissa Baker tallied five, while Danielle Jarvi and Maddie Brown combined for five. Baker topped the squad with five kills and Kaitlyn DeLauter added four. Miali Bard contributed 13 assists. Fairbanks’ varsity volleyball team improved to 19-1 overall and 14-0 in the Ohio Heritage Conference. The Lady Panthers rolled to a three-set sweep over Mechanicsburg. Scores were 25-14, 25-15, 25-15. -Grace Tomblin: 12/13 serving, eight points, 11/11 sets, eight assists; 14/21 passing. -Jayda Rausch: 5/6 seving, five points.